This week Fianna Fáil launched a proposal for state support of quality journalism by funding print news initiates. The aim is to boost quality journalism by addressing threats posed by falling revenue. To this end, it proposes to fund print news media projects by ringfencing VAT receipts from newspaper sales (est. €27 million) and/or imposing a 6% levy on all digital advertising sales (est. €30 million). It’s an analogue solution to a digital problem. Such a fund could also be used to support innovation and entrepreneurship in the digital news industry. 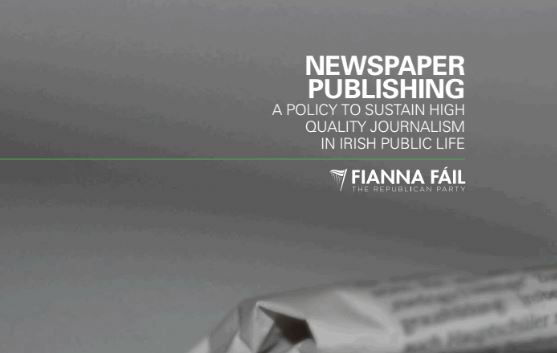 As noted in the Fianna Fáil report, newsrooms have been consolidated; print and digital journalism are produced under the same roof and some of the most popular news organisations in Ireland are digital only. There are opportunities to support established media to engage in a range of high-impact multimedia projects, but it could also support a growing body of digitally-native freelancers to work with them. There is also the potential to support quality digital journalism through investment in new initiatives. While the report cites initiatives to support print media in other markets, it overlooks other opportunities that benefit consumers but are not yet pervasive or present here. For example,the democratic function of digital journalism in larger markets is often supported by a range of cooperating initiatives and organisations. Some of the funding could be directed towards existing small-scale public interest projects or new additions to the news industry. These could include non-profits, independent fact-check organisations, specialised investigation units, new multimedia start-ups, cross-disciplinary publications, media literacy projects and more. These projects are forming part of digital immune systems in democracies by providing audiences with checks, balances, and supports to problems faced by mainstream media. They do not compete with the mainstream but work with it, improving the information environment. But it is difficult to get a foothold without seed funding. There are countless public interest digital journalism initiatives that could insert new and necessary features into Ireland’s online news landscape. Digital journalism is too important a component of how people are informed to be omitted from such a resource. Most people get their news online and consumer habits are unlikely to reverse. Meaningful solutions can’t be offline. Among the features of the proposal is the introduction of a Minister for Media, an expanded role for the BAI, which links it to the Press Council to directly fund quality print journalism. Some of these proposals are vague at this stage, nut on a prima facie basis could introduce as many problems as they claim to solve. It also joins the call for defamation reform and supports collective bargaining with advertisers and a tightening of copyright. There is no doubt that digital media has changed the landscape of democracies and presents new challenges to ensuring citizens are informed. The old traditional structures of democracies do not fit neatly into cyberspace where clicks, likes, data, profiling, and algorithms are so influential on news feeds. But what we need are digitally orientated, forward-thinking solutions that can address the multitude of ways in which citizens can now be informed.